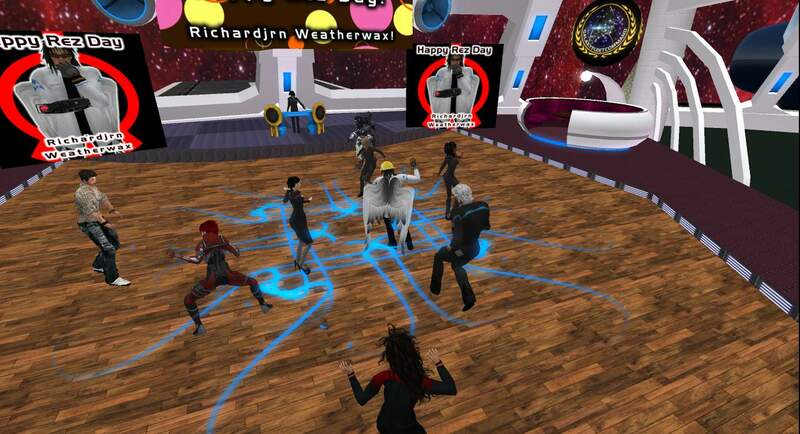 Its hard to believe its been 5 years since a fresh face prim avatar called Richardjrn Weatherwax loaded up SL for the first time and gave the 3D virtual reality platform a whirl. In those five years he has become one of the groups most recognized and talented scripter. Its hard not to travel around the 4 sims and not find something which he has had a hand in the creation of. To celebrate this feet of dedication and the fact that he had left SL toddler status Sophie Johnson arranged a secret party for him in the new Phoenix Station bar in Sovereign. The crowds gathered the music pumped and members, guests and ponies strutted their funky stuff. Congratulation Richardjrn Weatherwax and may you be here in another 5 years.